The territory of Oman consists mainly of desertic and semi-desertic plains extending for approx. 1000km from north to south at the southeastern tip of the Arabian peninsula. In the north of Oman the Al Hajar mountain range runs parallel to the coast for about 500km from northwest to southeast. The only other mountaineous areas are in the Dhofar region in the extreme south. The coasts are a mix of rocky sections and long, wide sandy beaches. 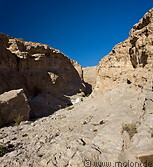 In the desert areas there are frequently oases, especially in the mountainous north.